I love it. 2 days in a row, I’m eating at restaurants that came to me via the Burger Conquest Contact Form. century’s bold answer to the classic burger joint. you. I definitely want us to be a part of your burger conquest! Well Ashley, with me and the Burger Conquest, flattery and the promise of Delicious Burgers will get you everything…or at least my mouth in your restaurant. 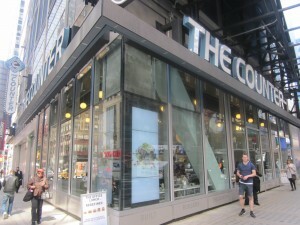 I’m a huge fan of The Counter, however I have never eaten there since their arrival into NYC. The LA based Burger chain, known for their insane amount of possible topping combinations, opened up last year right smack dab in Times Square. I’ve been meaning to pop in and see if the move across the country had any effects on their delicious selections. Ashley’s email became the catalyst for me to stop in. Marina Del Rey location: 1/3rd LB Beef Burger topped with Horseradish Cheddar, Bermuda Red Onion, Roasted Chiles, Fried Egg, Mixed Baby Greens, Honey Cured Bacon and Roasted Garlic Aioli happy served between the 2 sided love of an English Muffin. 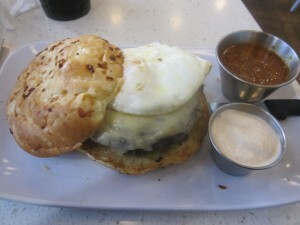 Santa Monica Location: Turkey Burger with Grilled Onions, Fried Egg, Spicy Pepperoncinis, Chipotle Aioli and Horseradish Cheese on a Honey Wheat Bun. Santa Monica location: 1/3rd LB Beef patty ordered medium rare, Horseradish Cheddar, Fried Egg, Applewood Amoked Bacon, Spicy Pepperocinis and Lettuce on a Multigrain Bun with a little Chipotle Aioli on the side for light dipping and taste accents. I arrived mid-afternoon, which if you’re looking to not be rushed or jammed in with a busy lunch crowd, is a great time to go. I met up with the very friendly and outgoing Ashley who started telling me about an idea to let neighborhood business create signature Burgers to be served in their offices with The Counter’s Custom Burger Bar delivery set up. 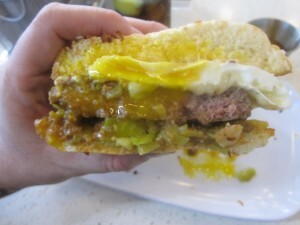 This sparked an idea, creating my own corporate Burger at The Counter’s NYC location. Yeah! 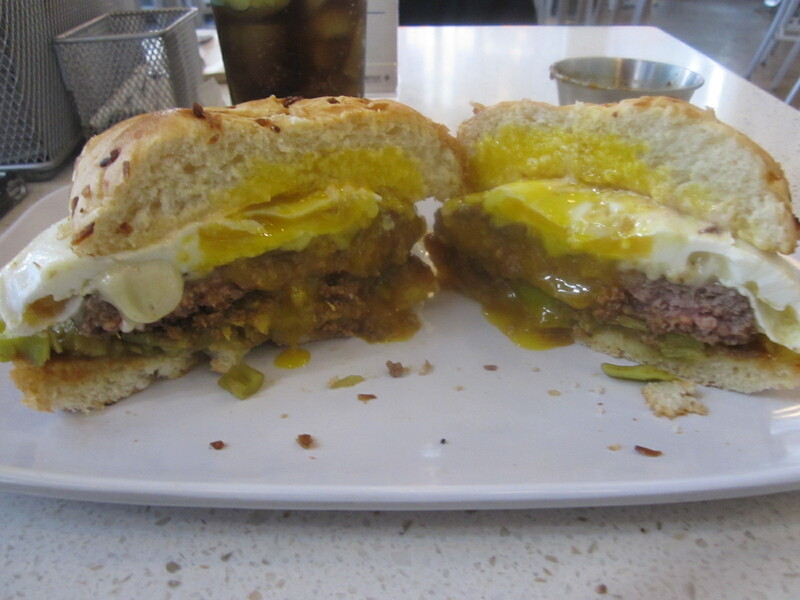 Management 11, LLC Burger: 1/3rd LB Beef patty with Horseradish Cheddar, Roasted Green Chiles, Peppeonrcinis, Chili, Fried Egg & Spicy Sour Cream. It’s sort of an amalgamation of past Burgs I’ve crushed at The Counter with an attempt to be a little spicier and messier. Let me tell, you this, the 2,800 miles between their Marina Del Rey and the NYC locations has had ZERO effect on their ability to serve fresh, great quality Burgers that are delicious and tasty. I’ll give major kudos to any restaurant that can serve a Burger that has not only a perfectly cooked medium-rare patty as well as a perfectly cooked over medium Egg! Holy smokes my friends!! This combo was a real winner and definite multi-napkin eating adventure! The Burger was just as good as it looks. This combo was so good that may give up on trying out the rest of the possible combinations and stick with the Yeah! Management 11, LLC Burger. The Counter scores a 5 on The Rev Meter. This entry was posted in Best Burger in New York, Burgers, Gourmet Burgers, National Hamburger Month, New York and tagged burger, cheese, ciancio, conquest, french, fries, great, hamburger, national hamburger month, new york, ny, nyc, rev, review, the, the counter, the rev meter for social community, times square, yeah management. Bookmark the permalink.